How Many Calories Do You Lose in 45 Minutes on a Bike? 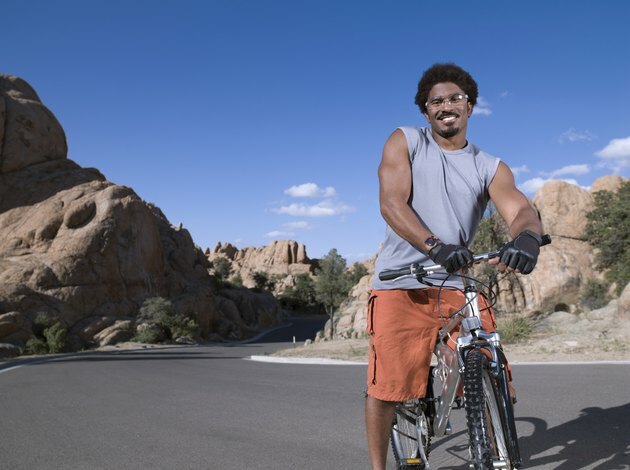 Bicycling is a versatile and low-impact aerobic exercise that also builds your leg muscles. Since you can bicycle under a variety of conditions at a range of speeds, the number of calories you burn also varies significantly. Fabio Comana's article for the American Council on Exercise cites data indicating that biking 10 to 12 miles per hour burns 0.045 calories per mile per pound of body weight. At 14.1 to 16 miles per hour, you burn 0.082 calories per mile per pound. The more you weigh and/or the faster you pedal, the more calories you burn. A heavier bike requires you to burn more calories to maintain the same speed on an uphill slope. If your pedal setup and bike condition are optimal, you'll go faster with the same energy expenditure, though efficient energy transfer also depends on your fitness and riding technique. According to Shape magazine writer Amy Goldhammer and data from the American Council on Exercise, a 154-pound woman riding a mountain bike off-road on moderate terrain, burns about as many calories per hour as she would riding a road bike on the road at 15 mph; 528 versus 526. She burns this high number of calories even though she rides slower off-road, because of the rougher terrain.